We’ve all had some experience with Excel’s automatic numbering. For example, if you have a simple list and you would like to add consecutive numbers to a column next to your data, you’d simply select the cells containing your first two numbers and then drag accordingly. Take a look at the sheet below to see an example. But real-world lists aren’t always so simple. And for certain data, a simple consecutive list just won’t do. 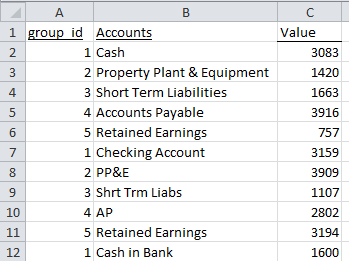 Sometimes we receive spreadsheets that have some type of intrinsic grouping but no unique group identifier. 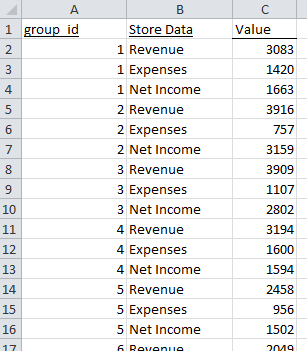 The challenge is that we would really like to apply Pivot Tables to this data, but we can’t do anything until there exists some type of group identifier. Take a look at the datasheet below from my nonexistent accounting information system. =INT((ROW()-2)/3) -> =INT((3-2)/3) – > =INT(1/3) -> = INT(0.33) = 0. I add one (“+ 1”) at the end of the formula so that my grouping doesn’t start at zero. That’s optional. In the following spreadsheet, we’ve culled information from many different spreadsheets maintained by many different people. The problem is that each spreadsheet administrator used a different naming convention for the same account (see the highlighted accounts). 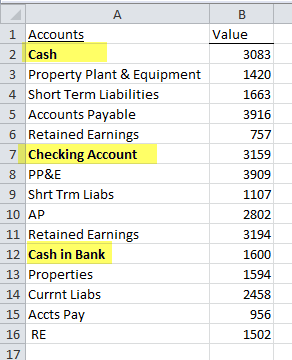 And take a look at the final Retained Earnings and note that it is labeled ” RE.” Those extra spaces can creep into the spreadsheet and easily go unnoticed. What a nightmare. =MOD(ROW()-2, 5)+1 -> =MOD(3-2, 5)+1 – > =MOD(1, 5)+1 -> = 1+1 =2. 1. Once you’ve created your new group_id column, it’s a good idea to select your new work, copy, and then paste as values. If the groupings aren’t going to change later, there’s no reason to keep it as a formula. Remember, fewer formulas means better Excel performance — especially if you plan to use a Pivot Table later. 2. If you’re not into the numbering scheme, create a lookup table that maps the numbers to a proper name. 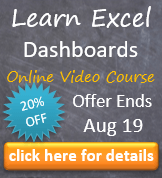 Create another column at the front of your data and use a lookup method, like Index, to map the correct names. Then do a copy/paste values. 3. If you have a list scheme you use quite often, you can actually save it as a custom fill series and then use it later. This entry was posted in Analysis, Formulas, Math, No VBA on March 22, 2012 by Jordan G.
Great, love using that kind of formulae ! !There's an easier way, however, to fill that gap, assuming always that there is a sequence. you just type in the first set of the sequence, select them, double click on the black cross on the bottom right to expand the selection to the rest of the list, and when prompted for the filling method, select copy series (XL 2003).